Umami Anasazi Beans - Vegans Eat What? Vegans Eat What? Ready to make this tasty vegan dish? Get your kitchen staples here! If you want to create a delicious “meaty” entree that both vegans and non-vegans will enjoy, this is the dish. Rinse and drain the soaked beans. In an uncovered pressure cooker, heat the olive oil on high. Add the onion slices and sugar and cook on high for 10 minutes. You don’t want to burn the onions, but you do want to caramelize them so stirring frequently is essential, as is adding water as necessary to avoid sticking. After 10 minutes, the onions should be brown and soft. Add the beans, mushrooms, liquid smoke, paprika, broth and water. Stir to combine. Cover and bring to pressure. Cook at high pressure for 5 to 7 minutes. Allow for a natural release. Remove the lid and stir in the miso. For a saltier flavor add the tamari. 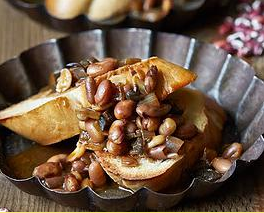 Serve with crusty bread or a cooked grain and enjoy! The recipe is from "Vegan Pressure Cooking: Delicious Beans, Grains, and One Pot Meals in Minutes", JL Fields (Fair Winds Press, 2015). It is made in a pressure cooker which you’ll be using with confidence following just a bit of advice from JL Fields. If you can’t find Anasazi beans, substitute pinto although doing so may require a slightly longer 'at pressure' cooking time. Wow, we're already speaking the 'lingo' of pressure cooking. Thanks JL!